Championship racecar driver Dale Earnhardt Jr. once said, “Finishing races is important, but racing is more important.” During their trip to the Brno Circuit in the Czech Republic, EMS Race Team didn’t finish as high as they hoped in the standings following their sixth podium of the season in Montreal last month. 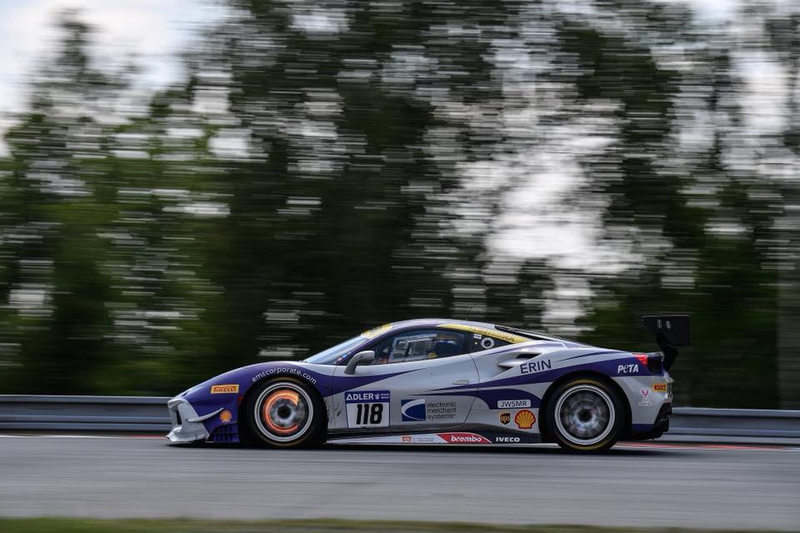 But driver James Weiland and the crew from Boardwalk Ferrari did continue racing around the world to raise awareness for PETA Cruelty Free, Coach Sam’s Inner Circle Foundation and Cornerstone of Hope. While helping to spread the word for these important missions, EMS Race Team would make the Czech Republic the sixth country they’ve raced in this season with an upcoming visit to Singapore next on the schedule. ERIN the ems+ Ferrari 488 Challenge qualified P2 for the second race in Brno after initially qualifying P5 for Race 1. Prior to the first race, however, two of the cars on the team accidentally had their data from Qualifying deleted prior to scrutineering and ERIN was one of the two. She was forced to start from the back as a result despite qualifying in the top 5. But ERIN would respond well to that adversity. After starting in the 16th position, she picked off a couple cars at the start and worked her way through the field to finish 8th in a race that was green the whole way. People for the Ethical Treatment of Animals (PETA) is the largest animal rights organization in the world, with more than three million members and supporters. Products proudly displaying the bunny logo are cruelty-free, meaning that they were produced without testing on animals. Coach Sam’s Inner Circle Foundation’s mission is to provide educational support to at risk children through a combination of literacy, personal development and health and fitness programs designed to develop the whole child. Cornerstone of Hope, meanwhile, provides support, education, and hope for the grieving. For more behind the scenes coverage of the Ferrari Challenge in the Czech Republic visit EMS Race Team on Facebook, Twitter and Instagram. Design by EMS Creative | Copyright © 2018 All Rights Reserved.